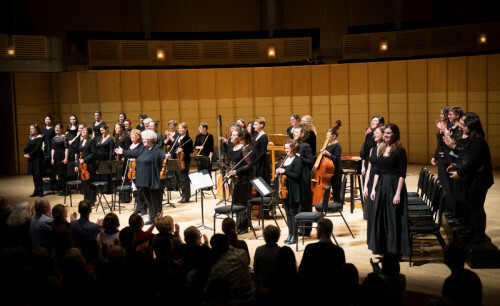 Early Music Vancouver’s final concert of the Christmas season has traditionally featured Bach’s festive cantatas. Nonetheless, we heard Michael Praetorius’ Christmas Vespers a year or two ago, and this time it was Vivaldi’s famous Gloria and Magnificat, performed under the direction of Monica Huggett. The intrigue of this concert was that it was undertaken by an all-female ensemble of 15 instrumentalists and 14 vocalists, affirming the historical insight that Vivaldi often relied on female troupes – at the convent Ospedale della Pietà – for the performance of his works. It would be difficult to convey just how ravishing this experience was: the excellence of the vocal and instrumental contributions, the freshness and depth of feeling throughout, all put together under Huggett’s inspired direction. It is nice that audiences in Portland, Seattle and Victoria were also able to see this concert. There was fine variety in the programme, with instrumental concertos and choral works interspersed. Vivaldi’s economical Laetatus Sum gave us an initial peek into just what type of vocal balance might be achieved with women’s voices only – especially interesting at the bottom end – but there was no problem at all. The (six) lower voices were absolutely well-defined within the texture, with a nice resilient force when needed, ensuring the counterpoint was fully transparent even in the more virtuosic passages. Huggett conducted from the podium for this work, and what artistry she displayed: the wonderful airiness and natural motion conveyed by the strings at the opening, the tightness and sophistication of the rhythmic structure throughout, and the strong unanimity and balance within both vocal and instrumental forces. Great thought was doubtlessly present in achieving this, but the results seemed free and life-giving, with a lovely emotional involvement from the singers. One tends to forget that Huggett has conducted for decades: she directed Beethoven symphonies with the Hanover Band in the early 1980s as part of the first recordings of ‘authentic’ Beethoven. Huggett returned to her usual leader’s chair for the Concerto for Oboe and Trumpet, and stayed there for the rest of the evening. The expressiveness of oboist Debra Nagy and the pungent tones and virtuosity of trumpet Kris Kwapis made this performance a delight, with nicely contoured textures backing things up, and always a fine sense of conversation between the instrumental voices. This does not strike me as a particularly easy work for the soloists to play. Perhaps there was an even richer sense of conversation in the Concerto for Oboe and Violin in the second half. The concerto has a striking Largo with a very expressive oboe line suspended over extended pizzicato for the violin. I had never seen Huggett play pizzicato with quite as much abandon as this; at the same time, Nagy continued to show what a sensitive and adept artist she is. The shadings in the ensemble’s string textures in the opening Allegro, the violinist’s characteristic sense of ornamentation and the carefully placed rhythmic accents in the finale added up splendidly. The Magnificat and Gloria present a challenge to conducting from the leader’s chair; a few nods here and there are clearly not sufficient to bring everything together. This turned out as quite a study in how Huggett could use a myriad of body postures and gesticulations plus a dagger-like bow arm – to summon the troops to arms – while still managing her violin part impeccably. In contrast to some of the brisk, angular treatments of Vivaldi we hear these days, there was often a gentle feel to the Magnificat, cultivating lightness and variety in texture but always securing a firm rhythmic line, and certainly ready to move into Vivaldi’s more elemental pedal chords with decisiveness. Perhaps the lighter, more flexible vocal textures opened up new possibilities for continuity and contrast, but the nine parts of the work seemed to flow together so naturally and with just the right scale, a radiant glow informing the whole. I particularly enjoyed the dramatic suspension achieved in ‘Fecit potentium’ and ‘Susceptit Israel’ while the soloists, soprano Jane Long and alto Debi Wong, sung their adjoining arias (duet) with an interesting combination of modesty and eagerness, exuding almost a collegial commitment to their vocal family on stage. There was coherence and sensitivity in all the singing, and the same applied to the Gloria at the close of the evening. The opening rhythmic figure of the larger work snuck in lightly yet crisply, building to strong choral flourish. ‘Et in terra pax’ carried on the involvement, bringing singing of real feeling. The two sopranos, Arwen Myers and Danielle Sampson, exhibited fine teamwork in ‘Laudamus te’ while Myers gave a truly delectable rendering of ‘Domine Deus’. The two altos, Laura Pudwell and Vicki St. Pierre, brought a contrastingly earthier and more robust demeanour to their later arias – very appealing too. What took this Gloria forward so cleanly was the combination of beautifully-judged orchestral execution with the choir’s ability to consistently find life and meaning in the underlying narrative. Time and time again one noted Huggett’s ability to elicit subtlety in vocal phrasing, to open up musical space, while always fostering a crisp sense of dialogue between the antiphonal choirs. Much of the instrumental articulation had a pleasing lightness and lyrical reach but there was an underlying awareness of the work’s drama too, and moments of real sinew certainly came forth, not least at the end. I found the whole fully suspending and delightful – and have rarely seen an ensemble enjoying itself so much. Perhaps that’s the real spirit of Christmas! Previously published in a slightly different form on http://www.vanclassicalmusic.com.